A nice feature about ArcWeb is these services are ready to go. No need to mashup something for the next hurricane. 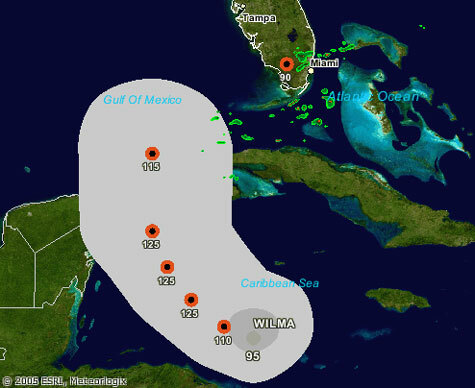 Anyway, as with Katrina and Rita, you can use the ESRI Hurricane Tracker to check up on the progress of Wilma. Unfortunately it is looking like it will be hitting the US, but hopefully it won’t be as large as Katrina or Rita. As with before, select “Current Hurricanes” from the Map Type in the upper right and navigate to the area off the coast of Honduras..
Also, don’t forget about the Geospatial One Stop Hurricane page where you can get all the latest data and information about the 2005 hurricane season.